Hyaluronic Acid: What is it? Why you need it in your routine (feat. Le Dew Beauty) — Beauty and Etc. As someone who has normal to oily skin, I used to be afraid of adding moisturizers and hydrating products to my skin routine. I always thought these types of products would make my skin oiler. Over the past couple of years I’ve tried out numerous products and really got a feel of what my skin likes and what it doesn’t. I’ve noticed that by incorporating more hydration into my skincare routine has significantly stopped my skin from over producing oils. The one hydration ingredient that I have grown to love is actually an acid. That acid is Hyaluronic Acid also referred to as H.A. within the skincare community. If you’re interested in seeing how I incorporate Hyaluronic Acid within in my skincare routine, keeping reading ! According to Dermalogica, Hyaluronic Acid it’s a gel like water holding molecule that binds moisture to help plump and hydrate the skin. Hyaluronic Acid helps retain over 1,000 times its weight in water within the cells of skin, making it an excellent moisturizer. I use Hyaluronic Acid both in my morning and night routines. I do think it’s an acid that everyone should be using due to its benefits. You may wonder if Hyaluronic Acid is good for ant-aging. I don’t believe H.A. can reverse the signs of aging. It’s an acid that provides immediate results as well. Immediately after applying H.A I notice that my skin will look and feel plump-up right away. It’s also great for diminishing the look of fine lines right away, but this is short term. I do believe that keeping your skin hydrated will help to provide a healthy glow; thus helping to make your skin look great. Where can Hyaluronic Acid be applied? Face, lips and other areas. Hyaluronic Acid can also be injected and used for dermal fillers. This post will solely focus on the H.A. being applied directly to the face through the use of serums. 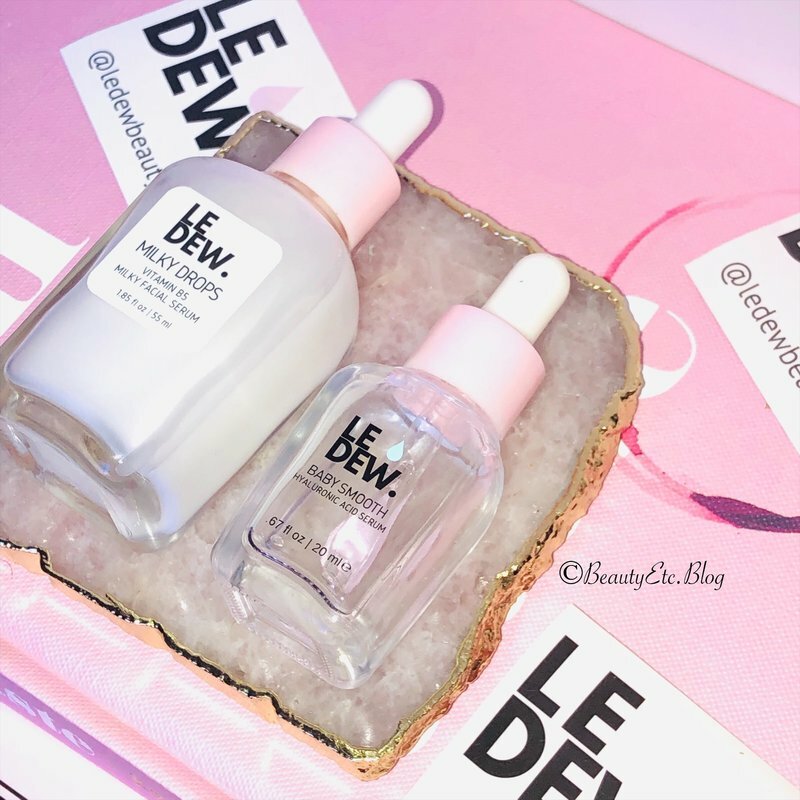 One of my newly found and favorite brands is called Le Dew Beauty. Their products are cruelty-free and made with clean ingredients. Their entire skincare line focuses on hydration along with nutrients that benefit the skin! Review: I love using the Baby Smooth Hyalauronic Acid in the morning with my vitamin C. I literally only need 1 drop for my entire face. That one drop melts into my skin. The consistency is gel like and is not sticky at all. The Baby Smooth serum doesn't have a scent or leave behind a film. Immediately after applying the Baby Smooth my skin looks and feels refreshed. H.A. works very quickly and fills in whatever lines I have on my forehead and my laugh lines. I’ve been using the baby Smooth H.A since the beginning of December. In the beginning I was using the serum both in the morning and night. But I prefer the next item listed below more for the night. I will continue to purchase the Baby Smooth drops and use it within my routine. I think this is a serum that can work for any skin texture and is great for all ages. Quick Tip: H.A. can also be applied to the lips. I’m going to start using this before bed right before I apply my regular night lip balm. Ingredients: Distilled Water, Carbomer, Sodium Hyaluronate, Glycerin, Butyleneglycol, Polysorbate 20, Palmitoyl oligopeptide, Palmitoyltetrapeptide-7, Triethanolamine, Magnesium Ascorbyl Phosphate, Dehydroacetic Acid, Benzylalcohol. The formula includes 60% HYALURONIC ACID and 1.5% PALMITOYL TETRAPEPTIDE-7- Made of various amino acids. Stimulates the regeneration of collagen and activates elastin, helping firm and plump the skin. Review: I purchased the Milky Drops about a month after using the Baby Smooth Drops. I wasn’t sure how the Milky Drops would fit into my routine. In the beginning I tried using it in the morning and at night. Ultimately, I prefer to use this serum in my night routine. My night routine involves the usage of a lot of different AHA and retinol. Both of these items can be drying to the skin and if used incorrectly can damage the skin’s barrier. The Milky Drops is made with B5 which is known to provide moisture, soothe and heal the skin. I’ve been using the Milky Drops since January. I’m happy to sale it has paired well with my other moisturizers. As the time gets warmer I’m going to experiment using the Milky Drops Serum with light moisturizers and sometimes alone. The formulation includes 5% VITAMIN B5 and 30% HYALURONIC ACID. There’s so many brands that carry Hyaluronic Acid within their skincare line. As I previously mentioned, I love using H.A. and I’ve noticed that my face has been so much more hydrated since using it. Do you use Hyaluronic Acid in your skincare routine. If so, is which Hyaluronic Acid serum are you using? What is Squalane Oil? + Why you should be using it!